1) Get really clear on your UVP and mission. Live it, breathe it. 2) Work with an attorney to set up your articles of incorporation, LLC, and all legal documents. 3) Obtain professional liability insurance. 4) Research your location. Talk to other business owners in the area. 6) Negotiate a situation where you pay only for the time you are actually using the space. 7) Build relationships with everyone in the neighborhood where your office is located. 8) Do trades with personal trainers and massage therapists so they can get a feel for what you do (and refer clients that are appropriate). 9) Start at a pace comfortable for you (keep your day job and start with one day a week, or one patient a week, or whatever is financially a good decision for you). 10) Have a website (even if it’s simple). I love to help other therapists start their journey toward being an owner. 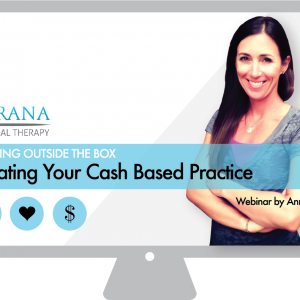 If you found these tips to be valuable, you might want to check out my Webinar, Starting a Cash Based Practice. I cover these topics and more, to help you get on the path to building your ideal practice. Thanks for the blog post. All very good ideas for starting a cash based practice. We have one in Bellingham, WA after moving from San Diego where we had a cash based and medicare practice. It’s been a relief to move to a totally cash based practice in some ways and also has helped us get out in the community more. Other things I’d recommend based on what’s worked for us so far is to do demonstrations and talks around town and at other practitioners offices. Also, there is nothing like going out and visiting doctors’ offices. They have a lot of clients who could use our help. So going and making friends with front office staffs and looking for things you can help the offices with or what the doctor may need help with are useful things to do. It’s interesting too, as many of the front office staff of doctors’ offices have a need for P.T. themselves! It’s a great way to show them what you can do.